Just one update for Software Updates but this is a nice one to have for many organisations. By default when we apply feature updates to a device through servicing plans, the feature update is given higher processing priority to hurry it through and make the experience as quick as possible. Many people would argue however that this should not be the case and actually feature updates should take minimal effect possible on the device so that the user can continue to work effectively during the upgrade. Microsoft have now added a priority within Client Settings. Under Software Updates, we can now set feature updates to run at a normal priority or a low priority. 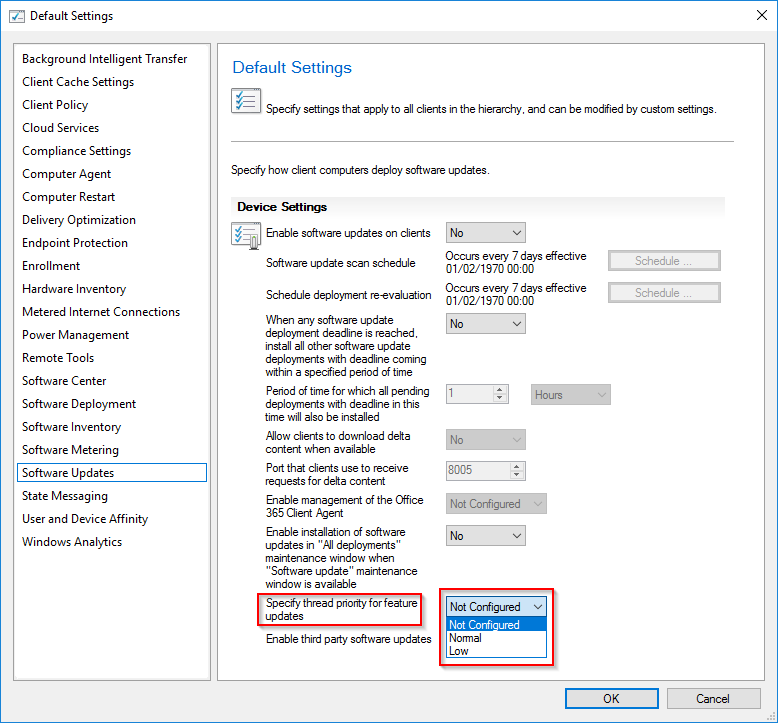 The default will continue to be high priority of you do not configure this setting. I like this option being within client settings as we can mix and match in our collections as there may be devices that are OK to be slowed temporarily and some that are not. Nice work.